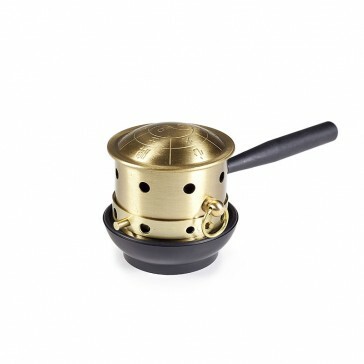 Brass moxa burner used for indirect Moxibustion. The brass body assures quick and even distribution of heat on the desired area. The chambers can be loaded both with roll and loose moxa punk. 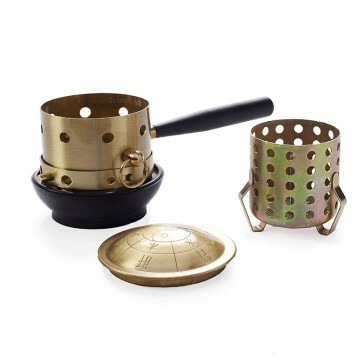 This burner features a double chamber compartment allowing the user to add ginger, garlic or other herbs to the outer chamber and have the desired material heated through by moxa from the inner chamber. Solid construction means this device is likely to last many years of heavy use. Elastic lanyard can be attached to secure the device to the patient’s arms or legs without worrying about the unit falling.